Roasting is hands down my favorite way to prepare vegetables. I usually head straight for the asparagus. It's like my safety net, I always nail it. But I'm on a mission to branch out and try new things lately, so that's how brussels sprouts found their way into my oven! 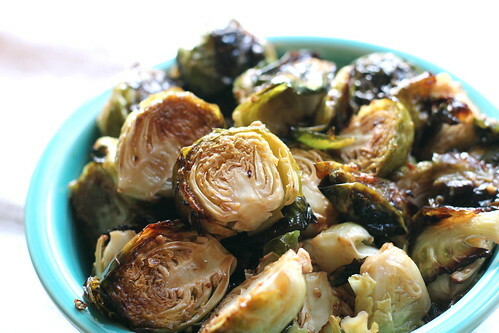 Roasted brussels on their own are flavorful in a mellow, creamy kind of way, but this recipe is special because they're dressed in a tangy dijon mustard vinaigrette after they're roasted. I served these sprouts with quiche but they'd make a perfect pair with pretty much anything, or even on their own as a snack or light lunch. 2. Whisk 3 tbsp. olive oil, dijon, balsamic, agave, and Worcestershire together in a small bowl until emulsified. 3. With a sharp knife, slice the stem end off the sprouts and then slice each one in half lengthwise. 4. Arrange the sprouts on a single layer on a foil-lined baking sheet. Drizzle with remaining olive oil and toss with tongs to coat. Roast for 25-30 minutes, tossing occasionally, until browned and crispy. 5. Toss with vinaigrette, serve, and enjoy! OMG, this sounds so good! !